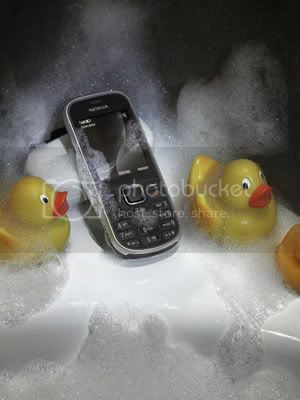 The new Nokia 3720 classic, an IP-54 certified mobile phone designed to resist water, dust and shock. Following the footsteps of Nokia’s highly popular ‘rugged’ devices of the past, the Nokia 3720 classic is encased in durable materials and is entirely sealed to protect the inner electronics. The Nokia 3720 is expected to retail for approximately EUR 125 before subsidies or taxes and is expected to begin shipping this summer. The Nokia 3720 classic features a sealed, leak-proof design and durable materials in a range of colours. The battery cover, which protects both the battery and the internal circuitry of the device, is locked with a screw, making for worry-free usage in wet, dusty or muddy environments. As to be expected, the Nokia 3720 classic also offers exceptional battery performance as well as an LED flashlight, to complement its rugged design. Additional add-ons include Nokia Maps, which comes pre-loaded on the 1 GB microSD memory card, and the large and bright 2.2” display is perfect for following the route even in unfamiliar terrain.